Kirsten and her new pup Zali. She is wearing Namiki, a design with a treetops motif, knit in Woolfolk Tynd. It is no secret that all of us at Sunspun are huge fans of knitwear designer and architect Kirsten Johnstone from Assemblage. 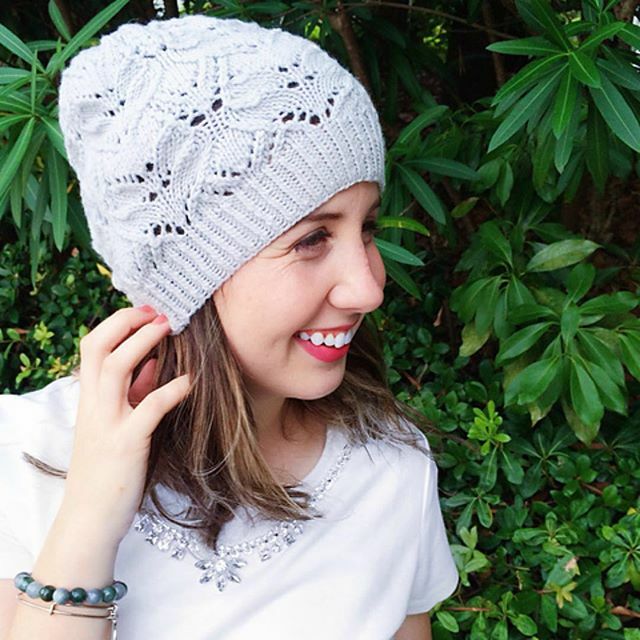 Kirsten’s knits often feature simple, classic shapes with subtle, effective embellishment, and the finished pieces are timeless, to be dressed up or down as the occasion demands. We admire Kirsten’s work so much that when it came time to refurbish our interiors in 2014, she was the logical choice, the one we thought who could understand the needs and workings of a yarn store, and how best to store and showcase yarn and finished objects. We are pleased to have Kirsten coming instore on 9 March as a special guest teacher; she will be showing knitters how to make her Seven Circle neckpiece. Call or email us to book your place. In the meantime, make yourself a cuppa and meet the woman behind the knits. Tell us a little about Assemblage: when it began, your ambitions for it, and how it has evolved. Assemblage began soon after I discovered online blogging. It’s hard to imagine today, but there was a time when I didn’t know there was an online craft community! I had read an interview in The Age and they listed a website address. I opened the link, not really understanding what a blog was, and noticed all these extra links in the sidebar. Well, I was off and cruising my way through many of those key blogs from that first wave of online crafting. It was such a pivotal moment for me in terms of crafting. I had always loved ‘making’ from a very young age and had stopped during my higher schooling and university years. The discovery of the online world of crafting was not only an encouragement but a relief – here was my tribe. The knitting side of things really began with my discovery of Habu Textiles; their Kusha Kusha Felted Scarf was my first knit project in more than fifteen years, which reignited the tactile delight that knitting imparts and opened up a whole new world of yarn possibilities. Element, from Wool People 9 for Brooklyn Tweed. Pic by Jared Flood. It’s been so gratifying watching your designs from Melbourne go out into the wider world, through your association with Brooklyn Tweed, Shibui, Amirisu, Quince and Co. and Blue Sky Alpacas. It must be satisfying seeing your design sensibility so warmly embraced, and so many iterations of Seven Circle, Rauin, Zumthor, Kozue and Hane out there. How did those associations start? It is always exciting to have my designs published and seeing people’s finished projects. My first association was with Brooklyn Tweed, who contacted me with an invitation to submit a design for the inaugural Wool People series. I cannot tell you how exciting that was! Then I was invited by Shibui to submit a design for their Geometry Collection – I submitted three for them to choose from, and to my surprise and delight, they used all three. I love seeing a little bit of Melbourne being included in collections around the world. Fusuma is a cowl knit in Shibui Pebble. When designing, are you led by the yarn you want to use or do you do your own thing? Or is it a combination of all that and other intangibles? I suppose each designer has their own methodology and typically it depends on the scenario. If I am invited to submit a design, then the yarn is effectively already chosen so that becomes a given. I try to maintain a sketchbook of ideas that I regularly refer back over. This is my primary design reference from which I draw ideas, perhaps annotate with a yarn and colourway, stitch pattern options, and thoughts on construction or design options for the piece. The actual design is always something I want to wear. I decided at the very beginning that I didn’t want to design just for the sake of it; I wanted it to be enjoyable since it is my second job and therefore needed to be about joy in the process. They are always designs I love and wear, and hope others might too. The treetops motif in Kozue are also echoed in Namiki. Your work is always so beautifully realised, the finishing impeccable, with details that lift a familiar silhouette into something more. What makes you tinker away at a hemline or a stitch pattern or revisit a beloved pattern of yours to give it a new twist? Thank you. I have learnt so much since my first forays into knitwear design. The perfectionist in me seeks to ensure a quality fit, excellent construction and knitting technique. This has continued to develop along with my own understanding of knitwear design. This is the beautiful thing about design in all its guises: each and every new project provides an opportunity to stretch myself as a designer, to grow, to develop, to try new things, to refine my process and outcomes. Rauin; pic by Tamara Erbacher. And how do you know when you’ve got it with a piece of work? Is something ever finished for you, or do you keep working away at published patterns – or, at the very least, let the subconscious work on it for you? Ah, yes! The eternal designer’s question: when is the design complete? There are definitely times when yes, I feel the design is exactly what it should be and I am supremely pleased with the end result. Sankai|Woman is an example of this. This design was an extension of one of my very first designs, Paper Crane. I love Paper Crane for its simplicity and how it plays with the inherent properties of knitted fabric to roll, which I showcased by juxtaposing two grains of stocking stitch across the bust. I thought these two features could also be applied in a more fitted and somewhat traditional sweater with some serious short-row shaping for a more polished result with hidden cuff details and tailored back shaping. Paper Crane (left) and Sankai (right) have a fraternal resemblance. Sankai pic by Tamara Erbacher. If I am submitting a design to a company, I spend at least a month sketching, swatching, washing, blocking, photographing, drafting and then writing up my design proposal. I submit a PDF with all the relevant design information, which might include a sketch of the piece drawn to scale with dimensions (yes, ever the architect!) and possibly front and back views of the design, the design concept, yarn, gauge, needles, stitch pattern, design details and techniques. Once the design is accepted, we agree on a date for the final knitted sample; it might be eight to twelve weeks later for a single piece, with a sized, graded and tech-edited pattern accompanying. It might then take between four to six months for the yarn company release the pattern to the public. So, all up, somewhere between seven and twelve months. For my self-published designs, the process is more organic. I have a small self-published collection coming out in Woolfolk Tynd soon. After initial sketches and swatches, I received the yarn and started work on the first design. Unfortunately at times the collection has been set aside for my work commitments but I am pleased to report I am now on the home straight. It has been two years in the making! Thankfully, not all my designs take this long – usually more like three to six months from start to pushing the ‘publish’ button. You can see from the above that my answer here is a definite no! For me, it is a process of countless hours of visualisation and contemplation, often in the early hours of the morning when I should be asleep. I prefer to knit each design because I finetune the piece as I go. My sample knitter is fabulous, but I try to limit her potential frustration by providing designs that I have already worked through at least once. I trust her to point out any errors or ways I could phrase a particular technique or sequence to make it simpler or more readily understood by another knitter. Hane; pic by Tamara Erbacher. We know you have another life as an award-winning architect. How do you reconcile both jobs? Do they play well together? It may be projection on my part, but it does seem like architectural elements find their way into your knits. While I love designing knitwear, I work hard to ensure it stays fun and is a positive, creative outlet. At the end of each day, I love sitting on the couch with my knitting for a little bit of ‘me-time’. Being an architect is definitely my main role and not something I am willing to give up just yet. I agree with you, my design aesthetic plays across both my architecture and my knitwear design: clean and minimal, highly functional and efficient, considered and refined. I also love sewing and photography, and have dabbled in ceramics and printmaking. I see a consistent design aesthetic across all these disciplines. The Fractal Cowl is a sliver of Melbourne for the world: the triangles in the body of the cowl are inspired by the architecture at Federation Square, designed by Lab Architecture Studio. What are the challenges to running your own business? How do you get the business and the creative aspects to mesh? There are many challenges. Architecturally speaking I always need to find new clients; the majority of my projects come via personal recommendation. Also work–life balance and time management (24 hours are simply not enough!) are big challenges. While there are many benefits to running your own business there are most definitely times I wish I could simply clock off and leave it all behind at the office. For me, knitting is an excellent way to relax and switch off while still being creative. I am passionate about modern design in all its forms – architecture, art, ceramics, fashion, food, furniture, sculpture … the list is long. Japanese design and designers. I love the concept of simplicity – the process of paring back to the essentials to release an inherent beauty or key element. Amime; pic by Tamara Erbacher. What is on the horizon for Assemblage? 2016 is going to be a great year for Assemblage! I have two design commissions to be released in the first half of 2016 along with new self-published designs, including two small collections in Woolfolk, two pieces in Habu and a re-release of a design in Shibui. I’m excited about the next chapter and I so love being a part of this crafting community. And a big thank you to Sunspun, who are avid supporters of my designs and my local yarn store. I look forward to meeting some of you at the class in March! It’s been such a pleasure having Kirsten with us. Come and say hello to her on 9 March for the Seven Circles class, and knit one of her designs – we promise you won’t be disappointed! Categories: meet the maker, Uncategorized | Tags: Brooklyn Tweed, knitting events, knitting Melbourne, meet the maker, Shibui, Sunspun classes | Permalink. Born in Sydney, raised in Austin, Texas, lives in Ubuyama, a small village on the Japanese island of Kyushu, surrounded by rolling hills, mountains and dairy farms. If there’s a citizen of the world, Françoise Danoy from Aroha Knits quite possibly encapsulates it, with her Franco–Maori, American–Australian heritage. It’s always a pleasure to find new-to-us designers whose work is simple, stylish and accessible, made even more meaningful when each piece incorporates a little of the maker’s cultural history. Beyond knitwear design, Françoise is also finding a way of turning her passion for craft into a viable, sustainable business. Her website is a treasure trove of resources for fibre lovers, offering inspiration, ideas, yarn reviews, giveaways, techniques and lots of practical, hard-won advice that may spark your own creativity. I graduated from Agnes Scott College in 2013 with a double degree in International Relations and French. I had always planned on going into graduate school for a Masters in a related field and pursue teaching, but then I discovered knitting. In late 2013 I had to go to the US from my teaching job in Japan to apply for US citizenship or risk not being able to move back (immigration laws are a pain). I picked up knitting during my down time between jobs and to keep my mind off of things like missing my then fiancé (now husband) who was still in Japan. It was during that period when my life path really started to shift. Tell us how Aroha Knits began. 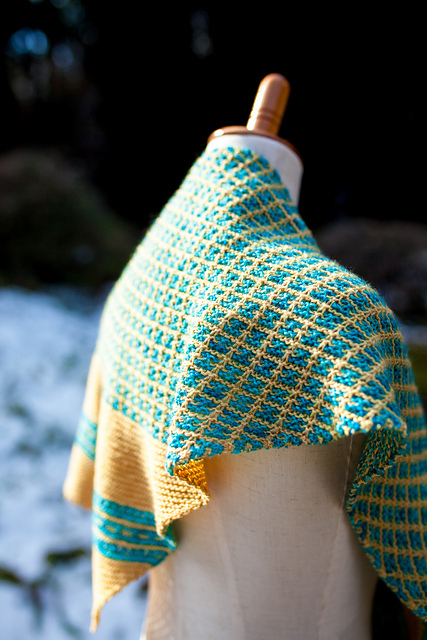 Aroha Knits was founded not long after I started knitting, in August 2014. By that time, I had already published several basic patterns on Ravelry under the name ‘Frenchie Knits’ and was preparing to move to Japan. I started thinking about what I wanted to do while I was in Japan with my husband, since I couldn’t work. I decided that since I enjoyed knitting and designing so much as a hobby, I would turn it into a full-time career and see how far I could go with it. I knew that I would want to incorporate Maori motifs into my work at some point so I changed the name from French Knits to Aroha Knits. Aroha is Maori for ‘love’ and is also my middle name. I thought the name more fitting as it reflected my culture and heritage, my love for knitting and how knitting has become a part of me. How important is incorporating Maori culture into your work? It is very important to me. Growing up, I never got the chance to learn about my mother’s heritage and living in the States didn’t help much either. Knitting has given me the strange opportunity to learn more about my culture as some of the designs lend themselves well to knitting techniques such as fair isle and intarsia. So many of us fantasise about days spent dreaming up designs and making, making, making! What does a day in the life of Aroha Knits look like? I have a set structure to my day that helps me stay on track and meet deadlines. The mornings are dedicated to photography, emails, social media and connecting with the knitting community. After lunch until my husband gets home from work, I use that time to knit, knit, knit any project I’m working on. On average, how long does a piece take from first swatch to publication or upload? There are a lot of factors that determine how long the process takes, but it can take anywhere from two to three months. I give myself a week to flesh out the design, make some swatches, chart out the stitch patterns, choose the yarn, etc. The next week or two is dedicated to knitting up the sample. The test knitting is the longest stage in this process so my testers have the time to knit up their samples and give me feedback – I know that many of them don’t have the luxury of being able to knit all day and I am a fast knitter. Then, after the test deadline, I take another week to make the final edits. Projects like the Puaka Shawlette took only about two months to get published, but garments like the Maia Tee or Whakamarie took about three months. The Huatau Cardigan takes the cake for the longest amount of time to get published: four to five months! And that was because I hired a tech editor and grader to look over the pattern for me and write up the different sizes, as it was my first garment. Because I am a monogamous knitter, I always try to get a new project on the needles as soon as possible. Sometimes I’ll have a design idea pop into my mind that I will start sketching out, but usually I start by doodling in my notebook and let the ideas come to me. I’ll flip through my stitch dictionaries and browse through Ravelry and Pinterest for inspiration, but once I have the final ideas down, I start knitting the sample and try to stay as close to my initial concept as possible. I do allow myself to make changes to the design as I work through it though. The test-knitting stage is mostly for testers to make sure the math checks out and the instructions are clear. However I do encourage them to make suggestions to the design to make it a more enjoyable knitting experience, say, by changing the type of increase, switching the design from being knit flat to knit in the round. One of the biggest challenges I face as an independent knitwear designer is that the industry is pretty unpredictable. I can spend weeks working on a design, taking good photos, executing a good marketing strategy to gain interest, but when I release it, it’s crickets. Sometimes my creative vision isn’t what knitters are interested in at the moment, but that’s OK. I’m still building my portfolio and ‘failures’ are only really failures if you let them kick you out of designing. I just have reconcile what I really want to knit with what knitters really want to buy. And it’s not a hard compromise since the knitting community is so diverse. I just have to accept that not every pattern is going to be a hit. I spend a good amount of time picking the right yarn for my designs. I usually sketch out my ideas first, fleshing out what types of stitches I would use in the design, determining if I want the project to focus more on drape, stretch, memory, etc. Because each fibre has its own strengths and weaknesses, I seek out the ones that would best compliment and work well with my design. I think everyone that I’ve talked to and met in the knitting community has inspired me in some way, whether it be long-time designers and yarn makers who have worked for years nurturing and growing their craft, to those who are just starting out and making that great and scary leap to get their careers kicked off … Everyone has a story to share that drives me to continue what I love doing most. What can we expect from Aroha Knits in the future? Obviously more pattern releases! That is my prime focus for Aroha Knits – always creating fresh, unique and creative designs that knitters will enjoy knitting for themselves. I am currently working on multiple projects: an ebook aimed towards aspiring designers that will take them through the steps of successfully releasing a self-published pattern. I am also working on some mini e-courses to compliment the book release, focusing on some of the content that the book touches on: for example, how to take flattering photos of your knits, managing and running social media accounts such as Instagram and Facebook. 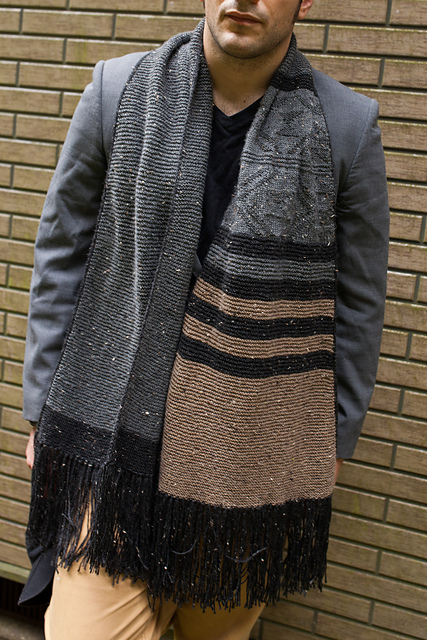 I also have a design collection collaboration with a fellow knitter who is also living in Japan that will heavily focus on the fusion of modern knitwear and Maori taniko. I have a very busy year ahead of me! Thank you for your time, Françoise! We look forward to following more of your knitwear adventures in the years to come! Categories: Knitting | Tags: aroha knits, Knitting Around, meet the maker | Permalink.